Good evening fellow scrappers! Today I bring you a pastel Christmas page. Now, pastel colors are not my norm when it comes to scrapbooking--I tend to go more for vintage/grungy colors. However, I really like how this page came out! For some reason these two photos of Toby sitting on Santa's lap alongside Santa's Little Helper said 'pastel' to me. So pastel it was. I've used papers by Pion Designs from their Santa's Little Helper II line. These papers came with the December kit by Funtoolas--a very cute Etsy shop filled with delicate embellishments & very well coordinated kits for scrapbooking. This will be the third page I've completed with elements from this kit. Needless to say, I've thoroughly enjoyed this kit! The peach crochet doilies are also from an Etsy shop titled 'Frog Feathers'. This little shop has lots of trims and other goodies that can be used for scrapbooking. I'm submitting this page to the Bird Is The Word challenge blog. This page is for their 'Wonder' challenge. The title is a combination of clear labels made with my Dymo Caption maker & letters adhered to a piece of clear acrylic/transparency. I've been using transparencies more & more on my layouts because it offers more dimensional possibilities. If you're a dimensional lover like yours truly--then this is the way to go. TIP: To position titles over ribbon, beads, pearls, brads or any other bulky embellishment--consider adhering the letters to a piece of transparency. As shown here the word 'wonder' was first adhered to a piece of transparency and then adhered over my string of pearls. You can't even see the transparency which makes it look like the word 'wonder' is perfectly balanced on my string of pearls! Speaking of pearls...I've had strings of pearls in my stash for the longest time in all sorts of colors. I figured it's about time I started using them. So lately I've been adhering them in a random sorta way onto my pages. I just like the randomness they supply to the page. I've taken out my splatter stamps once again for this page & have randomly stamped splats & splatters in the background. This stamp set is by Recollections & I found it at my local Michaels. The snowflakes & black flourishes are also stamps--these are by Inkadinkado. The two large white crochet snowflakes came with the Funtoolas kit. I once again used a bit of cheese cloth to mat my photos. I am loving the effect cheese cloth gives when tucked behind photos. The black flourishes were stamped on acrylic. TIP: Stamping your images on acrylic/transparencies gives you much more flexibility on the placement & orientation of your image. For example the flourish is actually the reverse image of the actual stamp. I liked how it looked better reversed. If it wasn't for the transparency--I wouldn't have this option. I further decorated the black flourish by adding some clear rhinestones & Star Dust Stickles. 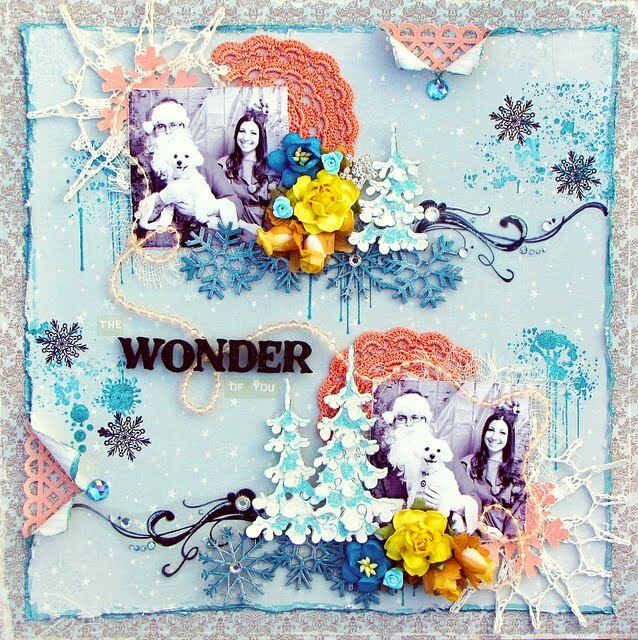 A close up of the snowflakes border chipboard. I first painted the snowflakes with metallic blue acrylic ink. I then randomly dabbed a bit of Silver Paint Dabbers on them by Ranger. Finally I randomly spread adhesive & sprinkled a bit of Fairy Dust Glitter by Donna Salazar on them. They're even more shimmery in person! These dimensional Christmas trees are making their second appearance. I first used these in my 'Magic' layout. I have made a tutorial for these trees & will post it soon. They are actually a stamp that I've altered to give the trees lots of depth/dimension. Thanks to all of you who stop by for a visit! I'll be back soon. This is gorgeous, love the pastels! THANKS SO very much in playing along over @ Bird Is The Word!!!! Wow Kay!... AMAZING layout! love it! Fabulous page, Kay!! lovely details and Toby looks so cute with Santa!